Super Mario Run now has an Easy Mode, allowing newer (or impatient) players of Nintendo's smartphone venture to go through the mustachioed freerunner with fewer hassles. Easy Mode gives players unlimited Bubbles (the game's version of a retry) as well as removes the time limit, taking the edge off for those easing into the game for the first time - as well as more versed folks who've hit a wall at the game's harder stages. The new difficulty option comes as part of version 1.1.0 of Super Mario Run, so anyone interested in trying out Easy Mode will have to update their game via the App Store. In addition to Easy Mode, Nintendo also changed the competitive Toad Rally mode to make Toads easier to gain and harder to lose, as well as some bug fixes and tweaks to prepare for future events. Since its launch in December, Super Mario Run has become a major hit for Nintendo, with the game raking in about 78 million downloads and approximately $53 million in revenue, according to the Wall Street Journal. The game has a fairly impressive turnout rate for a free-to-play title as well, with over 5% of its downloaders paying the (somewhat controversial, if you look at reviews) price of $10 to unlock all the game's features. However, Nintendo CEO Tatsumi Kimishima says he isn't satisfied with the results, with the company hoping for a double-digit conversion rate. 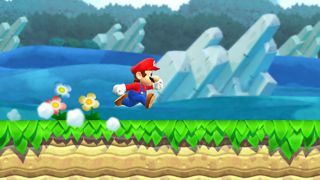 There's still a chance for Super Mario Run to make more bank, however, as the currently iOS-exclusive app hits Android devices in March. Following Super Mario Run and its joint operation with The Pokemon Company, Pokemon Go, Nintendo's next toe in the mobile waters is Fire Emblem Heroes, which repurposes the series' classic turn-based strategy formula for smartphones in February. Do always-online features help or hinder Super Mario Run?